In this recipe for chicken fricassee, the chicken is removed from the bones and returned to the thickened broth. 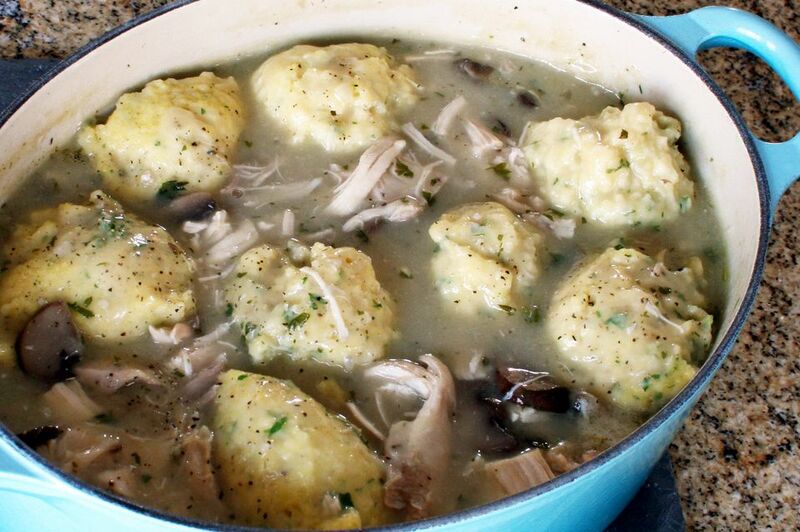 the drop dumplings make this a delicious, hearty stew. Serve with a salad for a delicious everyday meal. Place chicken parts, onion, chopped celery, 2 teaspoons of salt, 1/8 teaspoon of pepper, and 2 cups water in a Dutch oven or stockpot. Cover and bring to boil; reduce heat and simmer for 45 minutes, or until chicken is tender. Remove chicken from broth; set aside until cool enough to handle. Pick meat from bones. Discard skin and bones. Strain the broth into a 4-cup measure; add water (or low sodium chicken broth) to make 4 cups. Press vegetables through sieve or into broth. Return broth to the pot and bring to a boil. Stir 1/3 cup of cold water into the 1/4 cup flour to make a smooth paste. Gradually stir the flour paste into the hot broth. Continue cooking, stirring constantly, until thickened and bubbly. Return chicken to pot; heat to boiling over medium heat. Taste and add salt and pepper, as needed. Prepare dumplings. Sift flour, baking powder, parsley, if using, 1 teaspoon of salt, and paprika into a mixing bowl; cut in shortening. Stir in milk until dry ingredients are moistened. Drop dumpling batter in about 6 to 8 portions over chicken. Cook, uncovered, for 10 minutes. Cover and cook for 10 minutes longer, or until the dumplings are fluffy and cooked through. If desired, sprinkle dumplings with additional paprika and chopped parsley.